Simeon Ezra Hinshaw1,12,13,14,15,16 [Simon E. Hinshaw2,17]. 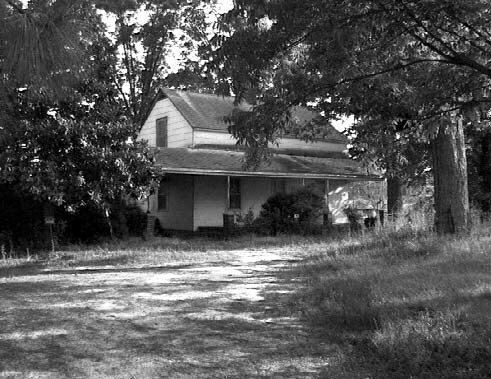 He married Treva Belle Dawson, Jul 29 1923, Randolph County, North Carolina.1,2,22 Treva, daughter of Ulysses Tyson Dawson & Roxana Lowdermilk, was born Jul 25 1903, Randolph County, North Carolina.2,3,4,13,15,17,23,24,25 Note: Treva was the sister of Cornie Montora Dawson who married Simeon's cousin James Boyd Hinshaw. Hinshaw, Simeon E., head-of-household, age 30, born in North Carolina; parents born in North Carolina; first married at age 23; owned home; no radio in home; occupation: farming, general farming; not a war veteran. 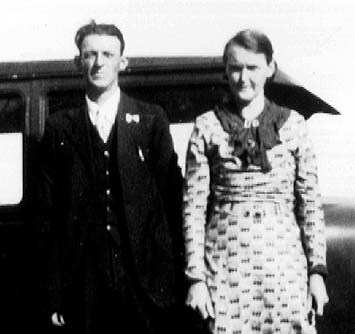 Hinshaw, Treva B., wife, age 26, born in North Carolina; parents born in North Carolina; first married at age 19. Hinshaw, Edward M., son, age 5, born in North Carolina; parents born in North Carolina. Hinshaw, Vogie M., son, age 4, born in North Carolina; parents born in North Carolina. 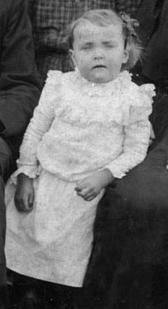 Hinshaw, Rosalie, daughter, age 2, born in North Carolina; parents born in North Carolina. Hinshaw, Bonnavie, daughter, age 2, born in North Carolina; parents born in North Carolina. Hinshaw, Jack C., son, age 1, born in North Carolina; parents born in North Carolina. Hinshaw, Simeon, head-of-household, age 40, born in North Carolina; completed 7th grade; on Apr 1 1935 was living in rural Guilford County, North Carolina; owned home; occupation: farming, farm. Hinshaw, Triva, wife, age 36, born in North Carolina; completed 4 years of high school; on Apr 1 1935 was living in rural Guilford County, North Carolina; occupation: housewife. Hinshaw, Edward, son, age 15, born in North Carolina; completed 1 year of high school; on Apr 1 1935 was living in rural Guilford County, North Carolina; attended school. Hinshaw, Vagie, son, age 14, born in North Carolina; completed 7th grade; on Apr 1 1935 was living in rural Guilford County, North Carolina; attended school. Hinshaw, Rosalie, daughter, age 12, born in North Carolina; completed 7th grade; on Apr 1 1935 was living in rural Guilford County, North Carolina; attended school. Hinshaw, Danavie, daughter, age 12, born in North Carolina; completed 7th grade; on Apr 1 1935 was living in rural Guilford County, North Carolina; attended school. Hinshaw, Jack, son, age 11, born in North Carolina; completed 4th grade; on Apr 1 1935 was living in rural Guilford County, North Carolina; attended school. Hinshaw, Max, son, age 7, born in North Carolina; completed 1st grade; on Apr 1 1935 was living in rural Guilford County, North Carolina; attended school. Hinshaw, Clay, son, age 6, born in North Carolina; on Apr 1 1935 was living in rural Guilford County, North Carolina. Mrs. Treva Dawson Hinshaw, 92, formerly of Climax died Thursday, Nov. 9, 1995 at The Evergreens in High Point. Funeral will be 2 p.m. Sunday at Bethel United Methodist Church with the Rev. David Heath officiating and burial to follow in the church cemetery. A native of Randolph County, Mrs. Hinshaw was a member of Bethel United Methodist Church and was preceded in death by her husband, Simeon E. Hinshaw and sons, V.M. "Jim" Hinshaw and Jack C. Hinshaw. 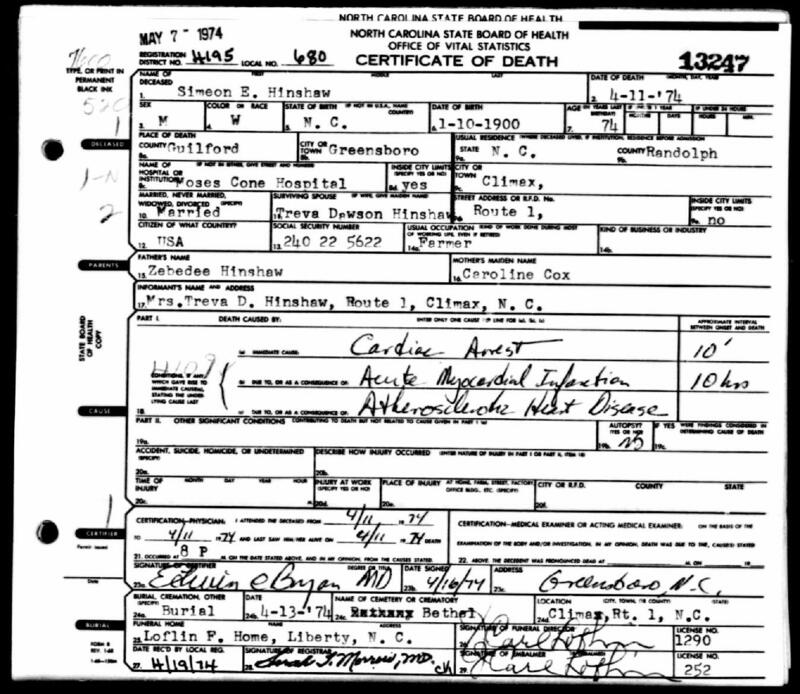 Surviving are sons, Edward M. Hinshaw of Burlington, Max D. Hinshaw of Climax and Clay C. Hinshaw of Graham; daughters, Rosalie H. Ashcraft of Dewitt, Ark. and Donavie H. Allen of Greensboro; brother, Glenn Dawson of Asheboro; 19 grandchildren, 13 great-grandchildren and one great-great-grandchild. The family will receive friends 7-9 tonight at Loflin Funeral Home in Liberty. Memorial contributions may be made to Bethel United Methodist Church, 8022 N.C. Hwy 22 N., Climax, N.C. 27233; or to Alzheimer's Disease, Triad North Carolina Chapter, P.O. Box 15622, Winston-Salem, N.C. 27113. 1900 census, Providence Township, Randolph County, North Carolina; roll T623-1213, ED 93, page 3A, line #23, dwelling #46, family #46. 1910 census, Providence Township, Randolph County, North Carolina; roll T624-1128, ED 93, page 210A, line #1, dwelling #14, family #16. 1920 census, Providence Township, Randolph County, North Carolina; roll T625-1318, ED 111, page 5A, line #16, dwelling #67-68, family #67-68. 1910 census, Cedar Grove Township, Randolph County, North Carolina; roll T624-1128, ED 79, page 46B, line #84, dwelling #13, family #13. 1920 census, Cedar Grove Township, Randolph County, North Carolina; roll T625-1318, ED 99, page 6A, line #45, dwelling #104, family #104. 1940 census, Providence Township, Randolph County, North Carolina; roll T627-2962, ED 76-27, page 6B, line #55, household #87. Photo courtesy of Lee Hoyt Hinshaw Jr..
Photo courtesy of Randall C. Dawson ().